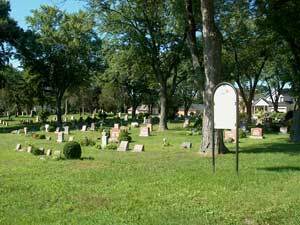 The cemetery was established in 1784 and was known as "God’s Half Acre". By 1791 the Presbyterian Meeting House was built on the site where the present church is now located. Many of Stamford’s early settlers are buried in this cemetery which was located immediately south of the church. Over the next two centuries the cemetery expanded to its current size with St. Patrick Ave. to the west and McMicking St. to the north. 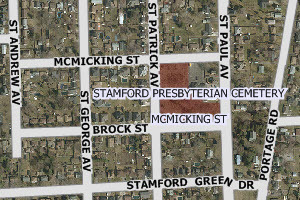 In 1943 the Stamford Presbyterian Church Cemetery was transferred to the Township of Stamford and in 1963 The Township of Stamford amalgamated with the City of Niagara Falls. There are no known records dating back to the first burial. It is believed that the records were destroyed due to fire in the early 1900's. There are, however, many excellent historical resources on the beginnings of Stamford Village and its pioneers that can be found at the Niagara Falls Library.